La Rioja (Agenzia Fides) - The Argentine diocese of La Rioja presented the logo and the theme of the beatification of Mgr. 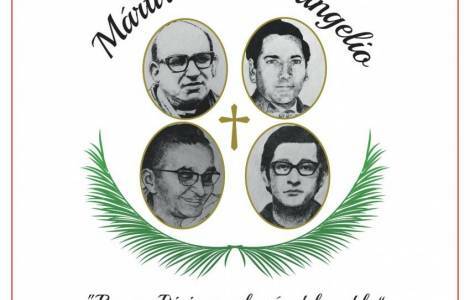 Enrique Angelelli, of the priests Carlos Murias ofm and Gabriel Longueville and of layman Wenceslao Pedernera, killed in hatred of faith in the summer 1976 (see Fides 26/10/2015: 29/07/2016; 2/8/2016; 4/8/2017; 9/6/2018). The rite of beatification will be celebrated in the diocese of which Mgr. Angelelli was Bishop, La Rioja, Saturday, April 27, on the feast of SantoToribio de Mogrovejo, patron of Latin American Bishops (see Fides 24/10/2018). In the official image we see the faces of the four martyrs with a cross in the center. The photos are surrounded by the words "Martyrs of the Gospel" and, below, by palm leaves, which symbolize martyrdom. Below is the phrase "Easter Riojana, joy of the people" and the date, April 27, 2019. "The life and martyrdom of these followers of Jesus are the 'joy of the whole people' - is written in the communication of the diocese sent to Agenzia Fides -. The Kingdom of God is for the people. In the Gospel, Jesus is close to the sick, the marginalized and the sinners. God loves the poor in a special way, they are chosen by God to call all of humanity to salvation. The Church, as a people of God, is called to be a community of brothers in favor of the most needy".